The Kiera Grace Groove is a contemporary round mirror with a rippled edge that mimics the "sunburst" trend. We stand behind our products. Holds 1 x 13 x 18 cm/ 7 x 5, 3 x 10 x 15 cm /6 x 4, 3 x 10 x 10 cm /4 x 4. For hanging in portrait format. For hanging only. Cook and bake. Find the bank details in the checkout process. Bath & Kitchen. -Material: Plastic with glass. Model: 74523. - Color: black. Antiques & Art. Confidential Of your information. Suitable for the following pictures: 10 photos 15 x 10 cm 2 photos 10 x 10 cm. 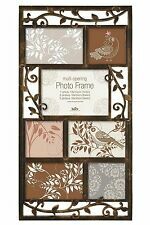 This picture frame is great for families to display your special moments. Great for any Decoration style. Comes with a quotation “our family is blessed” and black plastic frame. Dimensions: 4x6 inches (10.2 x 15.2 cm). Comes with an easel back and glass pane. Portrait and landscape. squiggly Profile. Baby & Child. Rotation lock. 12er Gallery. Bioethanol combustion chamber stainless steel also f. fireplaces. 49,99 EUR. The rear panel consists of chipboard. Cook and bake. Find the bank details in the checkout process. Bath & Kitchen. -Material: Plastic with glass. -for 6 photos a' 10 x 15. Model: 74523. - Color: black. Antiques & Art.